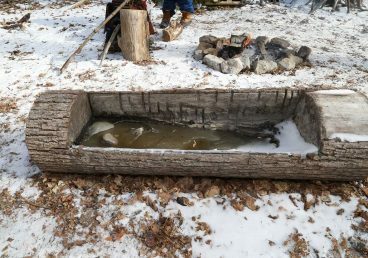 The process of making maple syrup is an age-old tradition of the First Nations people, who used it both as a food and a medicine. They would make incisions into trees with stone and bone implements their tomahawks and use birch bark containers to collect the sap. The sap could be reduced into syrup by evaporating the excess water by plunging hot stones into the sap. They also increased the sugar content by removing the frozen water layer after the nightly freezing of the sap. When the early European settlers came to North America, they learned from the Indigenous people that sap could be made into sugar. They European settlers had access to metals and used their metal iron tools to tap the trees and then boiled the sap in the iron or copper kettles. Maple syrup was the preferred sweetener used by the early settlers since white refined sugar from the West Indies was highly taxed and very expensive. As white refined sugar became less expensive, it began to replace maple syrup and maple sugar as a relied-upon sweetener. Maple syrup production is now approximately one-fifth of what it was in the beginning of the 20th century. In Canada, sugar maples are only found in select regions. 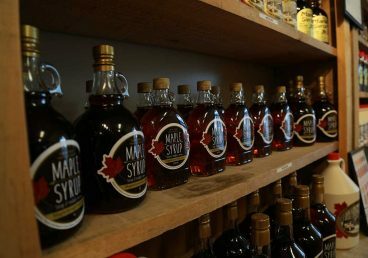 Canada produces about 85 per cent of the world’s maple syrup. It is the world leader in exports, selling about 30,000 tones valued at $147 million, to more than 40 countries in 2003. In Canada, the maple syrup industry is surpassed only by frozen French fries in single horticultural commodity exports. Consumption of maple products increased from 110 grams per person in 1991 to 160 grams per person in 2001. Marketing has evolved from selling to traditional markets to more value-added markets due to the ability of the maple syrup flavour to blend well with other food products (cereals, yogurt, etc.). This industry contributes to Canada’s value-added exports, since more than 60 per cent of maple exports are now shipped in prepackaged containers. In the early 1970s, science helped this industry by giving farmers new methods of production. Researchers developed better methods of gathering sap with tubing, using vacuum pumps, reverse osmosis and various types of evaporators, and addressing basic questions about how to make the industry more efficient. Today, Canadian production has some of the most innovative systems in maple technology. Maple Syrup Crossword and more! Birch Bark Mokuks and more! Autumn Maple Leaves and more! Whisk eggs in the top of a double boiler. Slowly pour in hot maple syrup while whisking constantly. Cook until thick, stirring constantly. Cool mixture. Whip cream to soft peaks. Gently fold in cream to cool maple mixture. Portion into parfait cups & freeze. Serve With Maple Pecan Shortbread. Cream together butter & sugar until fluffy. Scrape down sides & bottom of bowl. Add yolks gradually, mixing after each addition. Add maple syrup & vanilla. Mix until combined. Scrape down bowl. Sift flour & add to mixture all at once. Mix until just combined. Do not over-mix. Scrape down mixing bowl & add pecans. Mix until combined. Divide dough & roll into log shapes. Chill. Cut logs into 1/4 ” rounds. This recipe was developed by Pastry Chef Iris Roteliuk for the 40th Anniversary of the Annual Sugarbush Maple Syrup Festival. Roteliuk is a Pastry Chef at Summerhill Market in Toronto. Rinse and pat dry the chicken, cut into 4-6 serving pieces. Combine remaining ingredients and marinate chicken, cover and refrigerate, for up to 24 hours. Turn chicken pieces to ensure that they are covered with the marinade. Preheat oven to 400F. Place chicken in an ovenproof dish and bake until tender, approximately 40-50 minutes. Baste occasionally with pan juices. Serve, napped with Maple Sauce. While chicken is baking combine maple syrup, butter, Soya sauce and garlic in a small saucepan and bring to boil. Reduce heat and simmer until sauce is reduced to half and thickened. Season to taste with salt, pepper and cayenne. Yields 1/3 cup sauce. Slice the carrots. Cook until they are tender. Melt the butter, then add the maple syrup and ginger. Simmer the carrots in maple syrup mixture until glazed. Mix syrup and egg well together. Dissolve the cornstarch in the milk. Mix together well and put into a microwave bowl. Cook for 10 minutes at Level 8 (medium-high level), stirring every 3 minutes. Cream the shortening and sugar. Stir in maple syrup. Add sifted dry ingredients alternately with milk. Beat egg whites until stiff, but not dry. Fold into mixture. Turn on to greased 9-inch square pane lined with wax paper (or parchment). Bake in preheated 350F oven for 45-50 minutes. Turn out onto cooling rack, remove the paper and cool. Spread top and sides of cake with the maple icing; sprinkle chopped nuts. Boil maple syrup until it spins a thread (232F on candy thermometer). Pour slowly over the stiffly beaten salted egg whites, beating constantly with hand mixer or wire whisk. Continue beating until mixture is stiff enough to stand up in soft peaks.